If I use Pinterest for one thing and one thing alone, it would definitely be as a recipe book. (Well, as long as you don't count the seconds I've spent drooling over beautifully decorated fireplace mantles, perfectly styled side-bangs, and overpriced baby shoes.) I can't remember where I first saw this specific two-ingredient recipe, but when I planned to bake a dessert for guests this past weekend, I knew I wanted to try something I hadn't made before. Enter: a random recipe that doesn't sound like it will ever actually be edible. 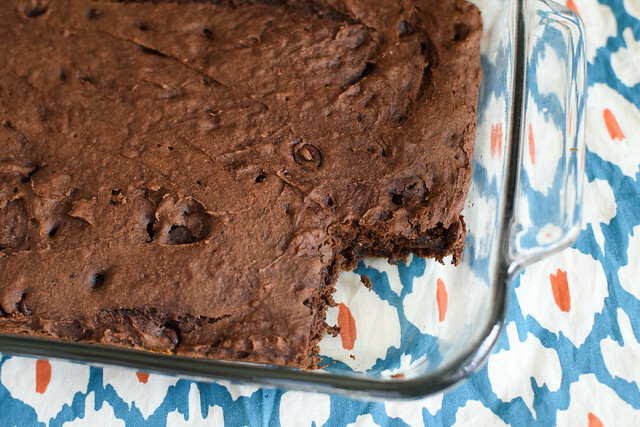 Two-ingredient brownies. With pumpkin. That's not weird at all, right? 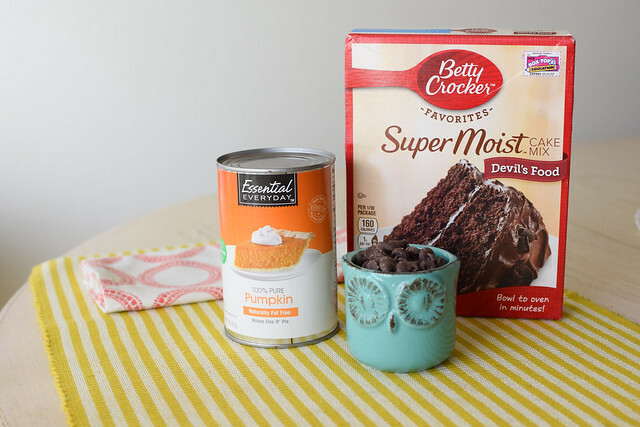 I looked at a bunch of different recipes before deciding how to go about making it myself, and it seems that you can choose to use boxed brownie mix or boxed devil's food cake mix. 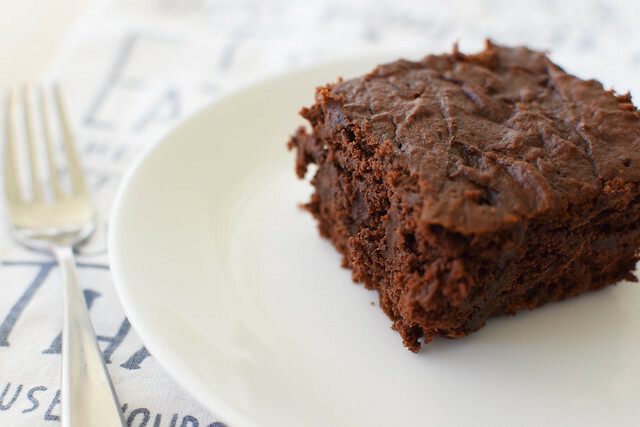 I chose the cake mix, because there seemed to be some very disgruntled people in the comment section of several blogs after using boxed brownie mix, claiming they didn't rise at all and tasted no bueno. However, I didn't see the same reviews when using cake mix, so cake mix was the winner! Also, these are technically three-ingredient brownies, because I had to throw in a handful (or owl-full) of chocolate chips. I totally recommend this, by the way. Always. So, there you have it! The only two ingredients necessary for this recipe. You don't put anything the boxed mix calls for, so just ignore it all together. No oil, no eggs, no water. 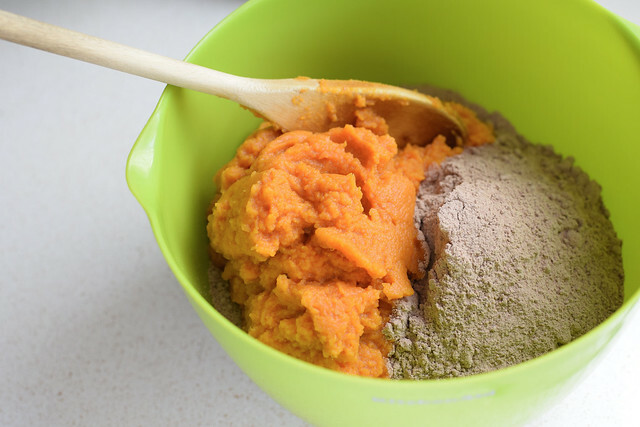 Just the dry mix and one can of pumpkin is all you need! There are a few different recommended baking times and temps, but our oven runs hot and isn't always trustworthy. I ended up baking it at 400 for just under 30 minutes. The toothpick was still a tiny bit chocolatey by the end of that time, but I took them out anyway because I was worried about it being dry. When I took it out, the top looked pretty dry and even after I cut into it, I was worried about it not being soft at all by the time we served it to our guests. However, I must say: it turned out to be perfectly delicious. I covered it with foil while it was still slightly warm, and when I opened it later, the top of the brownies (which ended up more like a cake/brownie hybrid, texture-wise) weren't dry at all. They were soft and delicious and didn't even really taste like pumpkin at all. I'm totally surprised! 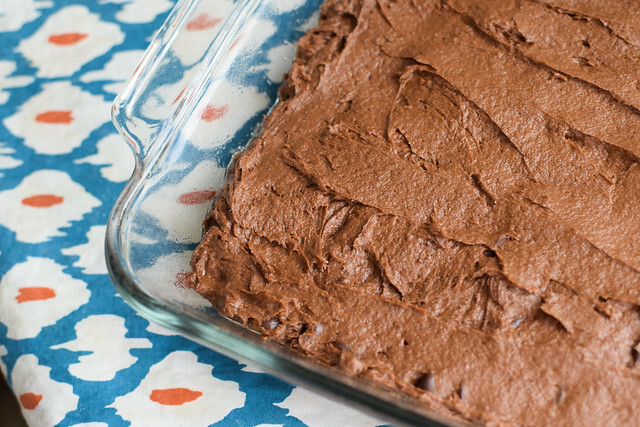 So inexpensive, simple and (dare I say) healthier than many chocolatey treats one could bake up. I mean, if you want some sort of chocolate fudge cake from the heavens you'll totally be disappointed because you can't have it all people. 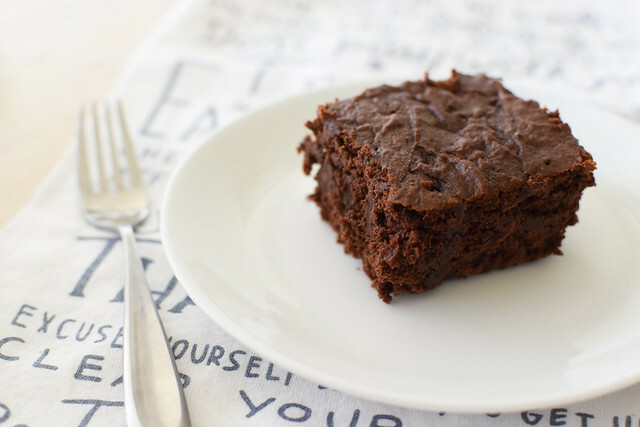 But if you are looking for a simple, delicious dessert that is healthier than a regular ol' cake, then this is up your alley! I'm definitely going to make it again. My recommendations? 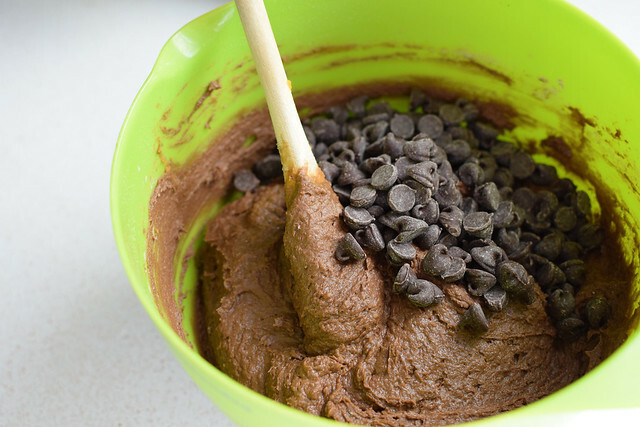 The chocolate chips are a must. Without any sort of frosting, I think it would have been too boring without the added mix-in. And I think these would be best served warm, with a side of vanilla ice cream. My biggest regret is not having ice cream. Always.